So, ’tis the season for skating shows! 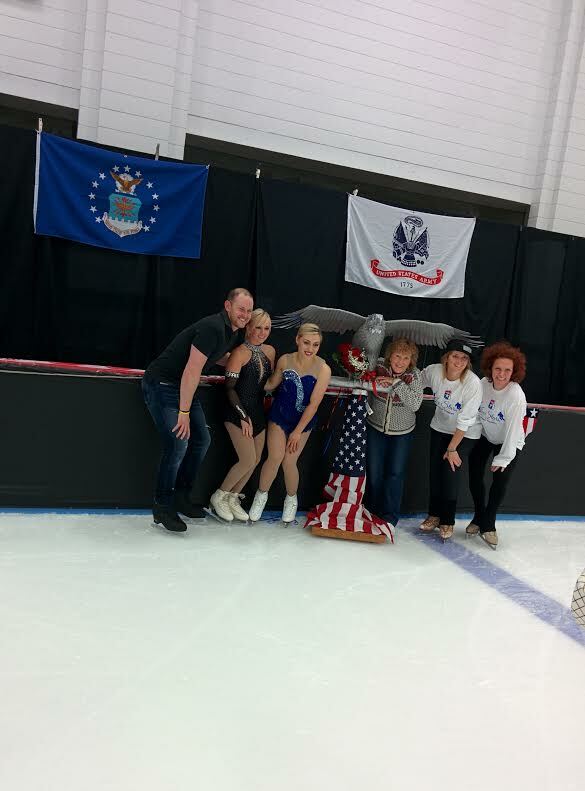 This weekend, I went to Ice Stars for Wounded Warriors 2015, a benefit show at the UMass campus in Amherst, MA. Proceeds from the show will benefit U.S. veterans returning from duty overseas. Most of the show’s cast consisted of local New England skaters, so it felt a lot like a club show. However, there were several special guests: Caydee Denney/John Coughlin, Courtney Hicks, and Yasmin Siraj. The UMass Synchronized Skating team performed two numbers. Their first program was set to somber, moody music, with the team in nearly all-black costumes. The routine included some intricate patterns and complex holds. Ocean State Theatre, a mixed-age theater-on-ice group from Rhode Island, skated a fun number to Annie, portraying the story of the musical on ice. Several ladies who compete at the juvenile/intermediate/novice levels in New England performed solo numbers, among them Dayoon Chang, Emile Laws, Madeleine Weiler, Gabriella Izzo, and Cate Fleming. These young ladies have lots of double jumps, nice spins, and quite good programs! A couple of them even landed double Axels. Also appearing was ice dance team Kimberly Wei/Ilias Fourati. They competed at Nationals this year at novice level and will move up to juniors this season. They performed a routine to Masquerade Waltz, which I assume is their SD for the upcoming season. It’s a nice program, although it still needs further polishing. 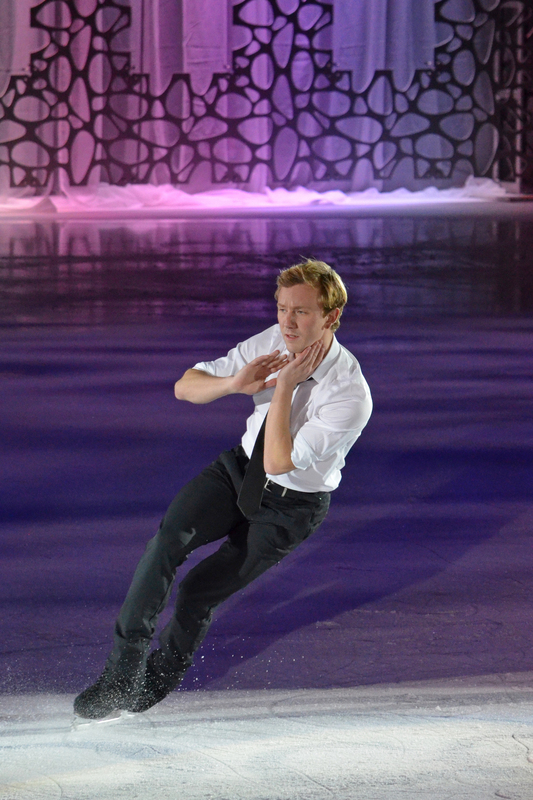 Junior men’s competitor Bennett Gottlieb skated to a Beatles program that showed off his strong, clean lines. He performed his signature backflip. Yasmin Siraj, former senior ladies Nationals competitor and current Harvard student, skated to Fergie’s “A Little Party Never Killed Nobody.” Yasmin wore a hot pink fringed dress and landed some double loops in this upbeat program. Courtney Hicks performed two standout numbers in the show. Her first program to “Fire” included a beautiful triple loop and double Axel and ended with a fast, crowd-pleasing headless scratch spin. (See video.) 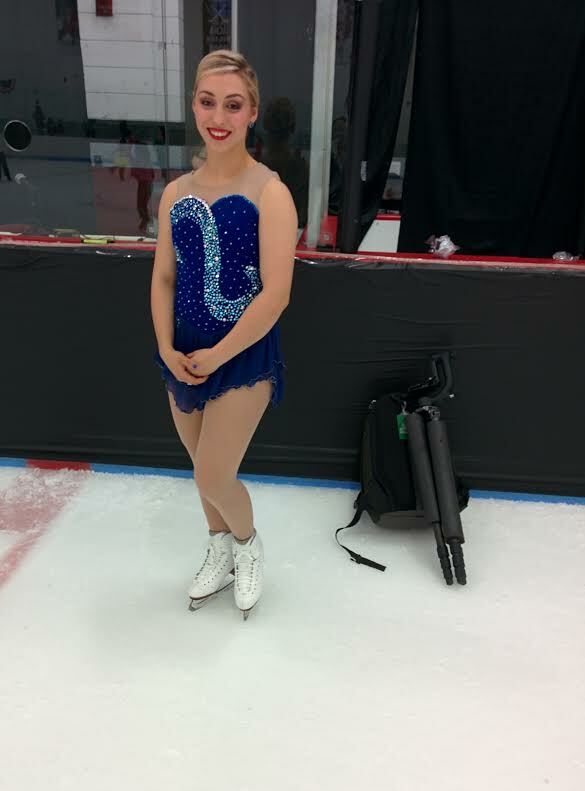 For her second program, Courtney skated to a lovely version of “Amazing Grace.” This routine featured a gorgeous, high triple flip, another double Axel, and amazingly fast, centered spins. The audience loved it, and many were standing at the end. Seeing Courtney skate live at a show is a quite different experience from watching her do competitive programs on TV. In a small arena, free of competitive pressure, you can really appreciate her exceptional speed, her soft knees, and her power. I haven’t seen many other female skaters who have the speed and flow that Courtney does in her exhibition programs. Her jumps are also amazing—so high and easy–and the runout on the landings is wonderful. I enjoyed the straightforward, emotional programs Courtney chose for this show. Although not widely noted for her artistry, Courtney definitely has the ability to connect with an audience when she has the right music and programs, as she did here. I was really, really impressed with her skating. Courtney landing a jump: Just look how deep her edge is! Caydee Denney/John Coughlin were also special guest stars in the show and performed two fun routines. Their first program was to “Uptown Funk” and included many crowd-pleasing athletic moves. (See video.) I heard lots of “wows” in the crowd around me. Caydee and John’s second program to a Bruno Mars song was softer and enjoyable to watch. In both numbers, Caydee and John performed a split triple twist, which was exciting to see! However, there were no throw or side-by-side jumps. Both programs also featured a new carry lift, which involves Caydee standing up on John’s shoulders with both feet (hope he has shoulder pads on! ), then dismounting with a flipout exit. The crowd loved this move. It was nice to see Caydee & John back on the ice again. Overall, it was a fun show for a great cause! 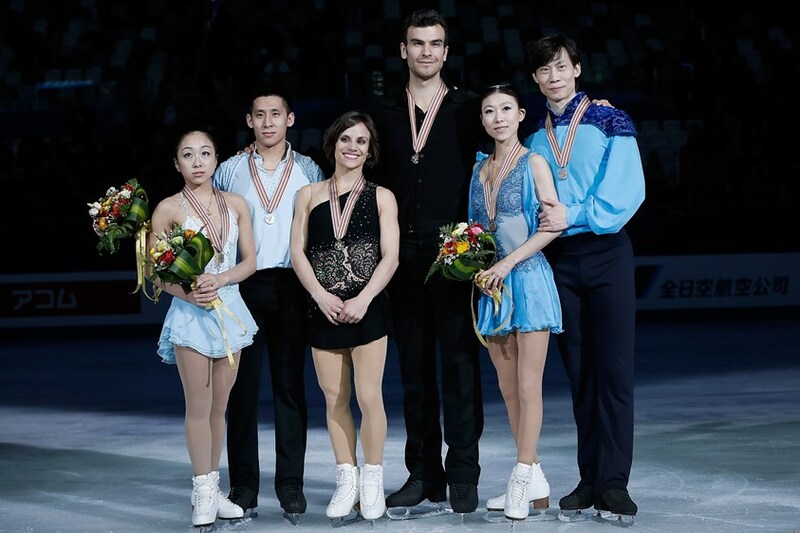 So, the skating season wrapped up this weekend with the World Team Trophy event in Japan. Although the pairs field in this event was small—only 6 pairs competed—it was still an interesting competition, with several surprises. The ISU did not tally official final results for the individual divisions in this competition. However, the unofficial winner of the pairs event was Sui/Han. Their unofficial total combined score topped Duhamel/Radford by a margin of 1.55 points. 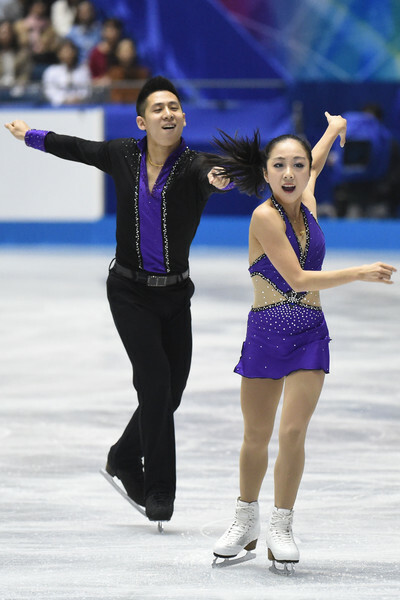 In the short program, Sui/Han took the ice as World medalists for the first time. A big milestone for them! They looked relaxed and at ease during their Stray Cat Strut SP. This program is fun and sassy, and it was nice to see them put out a good final performance of it. 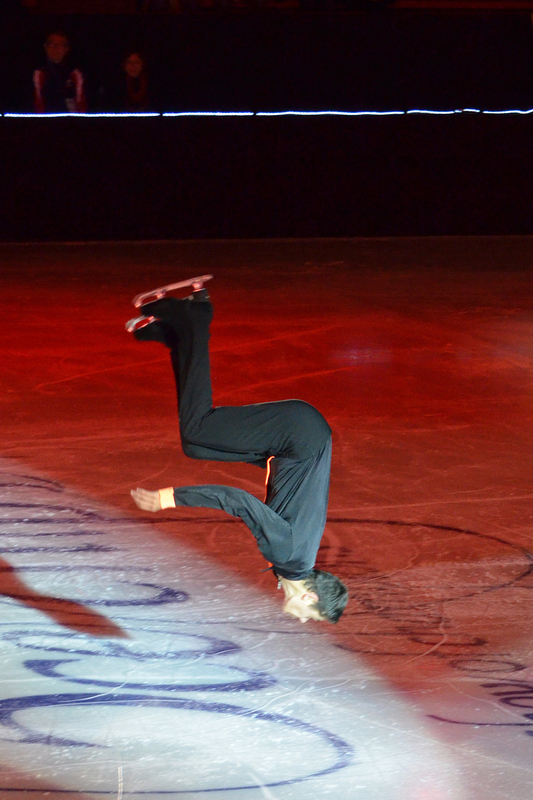 It didn’t have quite the same energy as their incredible SP in Shanghai, but it was very well delivered. They hit all their elements well, especially the throw 3F, which earned many +3s from the judges. They took 1st place. Sui/Han followed with a strong, emotional performance of their Francesca da Rimini LP. They opened with a beautiful quad twist, followed by a solid set of SBS 3T/2T/2Ts. Their throw jumps were both amazing, and the only error came on the SBS 3S, which Wenjing doubled. Sui/Han also excelled in their lifts. Cong maintains great ice coverage and speed, and their transitions between lift positions are quite smooth. It all adds up to lifts that are both consistently high-scoring and crowd-pleasing as well. Their program is packed with interesting, often lovely, transitional moves, and Wenjing/Cong performed it with a lot of intensity. They earned 139.73 points to finish 2nd in the long program, less than a point behind Duhamel/Radford. Following their silver medal at Worlds, Sui/Han got a nice PCS boost here at WTT. In both programs, their PCS was roughly a couple points higher than Worlds, and they actually beat Duhamel/Radford in PCS in the LP. Just as important, their GOE is through the roof. They earned 14+ points over base value in the LP alone. Their score sheet is a sea of +2s/+3s. Basically, the judges love the quality of their elements. With their success at Worlds and WTT, Sui/Han are in position for a big season next year. Talk about bad luck—Eric Radford came down with a severe case of food poisoning after arriving in Japan and wound up in the hospital. It was in doubt whether he and Meagan could even compete. Eric did manage to recover in time for the short program, and Duhamel/Radford skated very well overall in this segment. As usual, they earned level 4s on every element except the twist. However, unfortunately Meagan doubled the SBS 3Lz, and this mistake dropped them behind Sui/Han. The opening minute of Meagan/Eric’s Muse LP was rocky. The SBS 3Lz was landed but with a hand down from Meagan. Then she fell on the throw quad Salchow. However, after that mistake, D/R gathered themselves and skated the rest of the program like the world champions they now are! Their remaining elements were all well done and received good GOE. And they finished the program strongly. Their PCS was just a couple-tenths lower than Sui/Han’s, but once again their high technical base value carried them, and D/R placed 1st in the long program. Considering the food-poisoning ordeal, I think Meagan/Eric did well here. However, this competition showed that they’ll have to stay on their toes next season versus Sui/Han and other rivals. Coming into this event after a disappointing Worlds, I’m sure Yuko/Sasha were hoping for some redemption here. Unfortunately, it didn’t quite happen. Yuko/Sasha’s Mediation from Thais SP was as beautiful as ever. I love the freedom, flow, and lightness they have in this program. I thought Sasha, in particular, looked very relaxed. Their elements were all completed very well except, unfortunately, the SBS 3T. Yuko had an awkward stumble on the landing, which detracted a bit from the impression of the program. They placed 3rd. I have to say, though, I’ve felt all season long that their PCS should be higher for this lovely program. Unfortunately, Yuko/Sasha had a few problems in their Manfred Symphony LP. Yuko fell on the opening SBS 3T. The SBS 2A/2A sequence was good, and Yuko landed the throw quad Salchow (albeit a bit forward). However, their Axel lasso lift was slightly shaky. And although Yuko landed the throw 3Lp, she did not have full control/extension of her free leg, so that element got hit with a lot of negative GOE. It wasn’t a terrible performance, but it was well off their season’s best. They fell to 4th place in the LP. I think Kavaguti/Smirnov didn’t achieve quite the results were hoping for this year. However, they did win the European Championships. And their gorgeous programs this season gave fans a great deal of pleasure and will be remembered for a long time to come. Alexa/Chris had a strong competition at WTT to help the U.S. team win the gold medal. I thought their Tango de Roxanne SP was one of their best short programs of the season, as a total package. Their triple twist was spectacular and earned many +3s from the judges. Chris did put a hand down on the SBS 3S, and Alexa’s free leg was low on the landing of the throw 3F. However, these mistakes didn’t cost too much, and their other elements were good. I thought Alexa/Chris’s unison, polish, and crispness looked improved. Overall it was a good skate, and they placed 4th in the short program. Their LP protocol indicates, however, that they had a good performance in the LP. They landed the quad twist, earning 9.67 points. SBS 3S were apparently good, as was throw 3F. It looks like there was possibly a hand down or other slight problem on the SBS 2A/2A sequence (-1 GOE marks) and perhaps a foot down or stepout of throw 3Lp (-2 marks). All other elements appear to have been good with positive GOE. The PCS was their highest of the season. Their total score was 127.87, a new season’s best, and they unexpectedly pulled up to 3rd over Kavaguti/Smirnov in the LP. I’ll update this post with a better review of Alexa/Chris’s LP when/if video becomes available. Based on the LP numbers and their SP, though, I think you have to look at WTT as a big success for Alexa/Chris. They helped the U.S. team win the gold medal. They set a new personal-best score, as well as season’s-best overall and LP scores. Their total PCS was up 2+ points from their previous best. And, for the first time, they beat a top-tier competitor in one of the programs here. It all speaks to their continued progress. 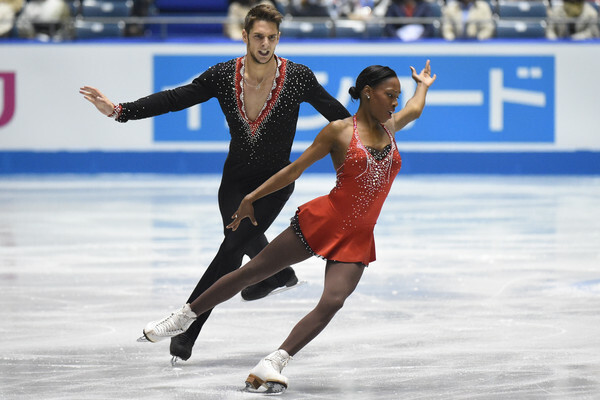 Prior to this event, Scimeca/Knierim told TeamUSA.org that they will get a new long program for next season but will keep their Tango de Roxanne SP. At first, I was disappointed by this news. I really prefer to see skaters get 2 new programs every year–I feel it’s an important part of moving forward artistically. (Also frankly, as a fan, it’s nice to hear new music and see new routines!) However, after seeing S/K here at WTT, I’m feeling a little better about it. The truth is, it took Alexa/Chris a while to get fully comfortable with this SP. Their first few outings were quite tentative, but now they’re really starting to look in command of the program. Meanwhile, Alexa said in her recent WiSP podcast that they intend to spend a lot of time polishing and refining their movement this offseason in order to improve their unison and presentation. I am guessing that they feel they can focus more on detail work if they’re not learning 2 new programs at the same time. So maybe it will all work out for the best. Vanessa/Morgan also skated their SP to Tango de Roxanne. They had an okay performance. Vanessa stumbled out of the SBS 3T. The footwork sequence was also kind of leaden and heavy-footed and dragged the program down a bit. They placed 5th. James/Cipres had their strongest LP of the season at Worlds, so I was hoping they would do well in this segment at WTT. Alas, their LP wasn’t great. They went for a 3T/3T sequence as their first jumping pass. This surprised me, as they’ve been doing 3T/2T/2T all season. Not sure why they changed (the two elements are roughly the same value), but in any case, Morgan put a hand down on the second 3T. Vanessa then landed awkwardly on the SBS 3S and later fell on the throw 3F. There was also a problem on the throw 3Lp. They scored 109.31, almost 10 points off their Worlds LP, to place a distant 5th. Worryingly, their total GOE for this event was slightly negative—meaning that overall, they did not even receive credit for all the base value they attempted. That is not where they want to be. Not sure what the offseason will hold for this pair. This was the first senior event for Ami Koga/Francis Boudreau Audet. Earlier this spring, they competed at Junior Worlds and placed 6th. They’ve been together for 2 years now. Ami/Francis skated to Madame Butterfly in the short program. I loved their costumes and found the program quite appealing. They had some technical errors, but their lines/unison are good for such a young team, and I thought Francis in particular had a nice feeling for the music. They placed 6th. Their long program is set to Spellbound Concerto by Rozsa. It’s an interesting program with some lovely transitions. However, their inexperience definitely showed in this segment. They were noticeably slow going into several elements, and again had a few technical errors. Ami singled the SBS 3T and two-footed the throw 3S. Ami’s lift positions are nice; however, the rotational speed of the lifts needs improvement. Also, they only did a double twist. I like this young team, and they have a nice look. However, they need more speed and power in their skating to be competitive at the senior level. This was a fun event to officially end the season! I’m sure many of the skaters will be going on much-needed vacations now. Best wishes to all of them over the offseason! This past weekend, I had the pleasure of going to Ice Chips 2015 in Cambridge, MA. I’ll just mention some of the highlights here on my blog. Ice Chips is an annual show run by the Skating Club of Boston. Although it’s a club show and the cast consists primarily of club members, the show also features at least one special guest star each year. This year, it was none other than Gracie Gold, fresh off her 4th-place finish at Worlds. But what makes Ice Chips fun is that it’s about the skaters of the future, not just the sport’s current stars. The first half of this year’s show featured group numbers from the young skaters in the club. Each routine included competitors from a certain level (e.g., juvenile or novice ladies), with one or two skaters performing short solos. It’s fun seeing the kids get a chance to wear fancy costumes and perform in front of a big crowd. You see a fair number of mistakes in these routines, but it’s all part of the process of learning how to skate and perform. The group numbers were set to upbeat music, and the kids seemed to enjoy themselves. Among the group-number soloists, two who stood out for me were Bennett Gottlieb and Liza Hayes. Bennett is the current junior men’s New England Regional champion. He skated to a Beatles segment and had great extension and nice performance quality. He performed a backflip and several jumps that excited the crowd. Liza Hayes is the intermediate ladies’ Eastern Sectional bronze medalist. I was impressed with Liza’s nice line and presentation in her solo segment to a Madonna song. 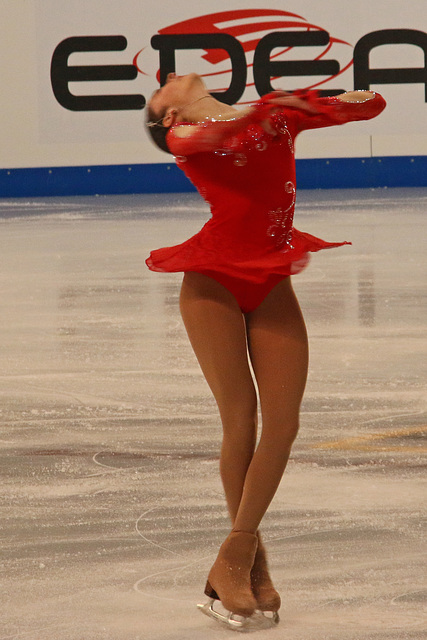 A highlight of the first half was novice pairs skater Alexandra Iovanna’s solo to “The Prayer” by Celine Dion. This program was a tribute to Alexandra’s father, who died last year, and she skated it beautifully, with a lot of emotion. We were also treated to a performance by Act I of Boston, the club’s senior-level theatre-on-ice team. Act I skated a really interesting number to moody, intense music. The choreography featured Alex Shaughnessy as a vaguely menacing, queenlike figure, surrounded by a group of writhing followers. I loved this number and found it captivating. Alex was smoldering and convincing in the centerpiece role! After the show, Alex and partner Jimmy Morgan said that Act I of Boston will be going to France next week to participate in an international theatre-on-ice competition—quite exciting! Gracie Gold closed the first half of the show with a fun performance to Taylor Swift’s “Shake It Off.” Although this song is crowd-pleasing, I think it’s actually quite challenging to skate to. The beat and lyrics are all very short and staccato, and it’s a bit difficult to translate that to the ice. Gracie does a good job, though, with this number. It’s very polished, and the dance moves are effective to the music (if a bit lacking in flow). Gracie included a triple Lutz and triple toe loop in the program. The second half included several group numbers featuring the older teenaged skaters in the club. These group routines again had some short solos, including one from Heidi Munger, who is senior ladies’ New England Regional champion. Heidi has a delicate, precise style on the ice and hit some pretty positions in this routine. Next came a series of solo programs from some of the better-known skaters at the club. Rebecca Peng skated a nice number with a couple of triple jumps. She has attractive positions and good speed, but could improve her interpretation of the music. Peng was 6th in junior ladies at Nationals this year and recently won the Challenge Cup, an international junior event. Next up were Alex Shaughnessy/Jimmy Morgan, who were 10th at Nationals this year in senior pairs. Alex & Jimmy performed a fun number to “Uptown Funk.” They are so enjoyable to watch and did a great job selling the program. They landed a throw triple Salchow (slightly two-footed) and had good footwork. I loved their gold-and-black costumes, created by Alex’s mom, Ann Shaughnessy. They were perfect for the showy routine. DeeDee Leng/Simon Shnapir performed a new exhibition program to “Beneath Your Beautiful,” choreographed by Renee Roca. They skated with nice smoothness and landed a throw double jump. This program has clean, simple choreography, which suits DeeDee and Simon’s straightforward style. They went for very simple costumes—jeans for Simon and black workout pants for DeeDee. I might have preferred something just a little more fancy. Next up was Ross Miner, who also skated a new exhibition program to Justin Timberlake’s “All Over Again.” Choreographed by Massimo Scali, this program is really gorgeous to watch. I loved the deep, long curved patterns that Ross created with his stroking in this routine. Ross’s basic skating is so strong. I love the crispness and stretch in all his movement, and his commitment to the choreography. His spins are also terrific–just so fast, with great, fully extended positions. Ross also landed a triple flip (slight stumble out). For me, his program was the highlight of the show. Gracie Gold came out next to perform her second number. She had a costume malfunction before she could start—her back neckline clasp came undone—and she had to skate off for a moment to get it fixed. Luckily, this didn’t faze Gracie at all. She came back out, laughed off the snafu, and launched into her second number to Beyonce’s “I Was Here.” Gracie did a nice job with this intense song, skating with good speed and polish. She again landed triple Lutz and triple toe loop, as well as a nice double Axel. Her jumps looked easy and strong, and her spins impressed as well. She looked happy, and it was nice to see her skate without the nerves and errors that have plagued her at times this season. After the show, Gracie told IceNetwork’s Sarah Brannen that she enjoys performing in occasional shows such as Ice Chips, but that her favorite part of skating is her daily practice/training routine (rather than touring). The entire cast closed the show with an energetic Michael Jackson number. It was cute seeing all the kids out there again on the ice! I thought this year’s Ice Chips was well produced. Everything ran smoothly, with no delays or glitches. The costumes were really nice and high-quality (especially considering how many costumes there were in the show!). The group-number choreography was at a level that the younger performers could handle; some of the numbers for the older skaters could perhaps have been a bit more sophisticated. The event reportedly drew good-size crowds for all three shows, which is really great for the club. Overall, I’d say it was a fun and successful 103rd edition of Ice Chips! What a pairs event in Shanghai! I had high hopes going in and was not disappointed. I thought the pairs, as a group, skated great at Worlds. There were many season’s-best performances, and the skating was at a high level, particularly in the short program. 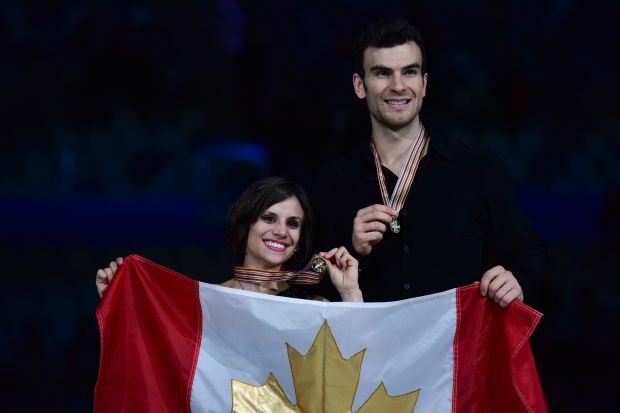 The moment truly belonged to Meagan Duhamel and Eric Radford, who earned their first World title and dominated the field. However, the event also belonged to Hongbo Zhao, Bin Yao, and the Chinese pairs, who all turned in magical performances to place 2-3-4 behind Duhamel/Radford. All season long, I had felt certain the Chinese teams would put forth their absolute best in Shanghai. And they sure did! What a moment for them, at their first-ever home Worlds. Let’s take a look at how all the pairs did! What an incredible season for Meagan/Eric: Winning every competition they entered and capping it off with a well-deserved World title! I saw them skate last September at Evening with Champions in Boston. Who could have guessed then what lay in store over the next 6 months? Duhamel/Radford opened the competition with yet another outstanding short program. They had no mistakes and scored 76.98, which put them in the lead by 4.39 points. Meagan/Eric started off well in their Muse LP with a very good triple twist and solid SBS 3Lz. Then things got a bit dicey: Meagan put both hands down on the throw quad Salchow, and Eric fell off his rotation in the SBS spin for a moment. However, as at 4CCs, they recovered quickly, and all the remaining elements were well done. Their performance level was a little subdued emotionally compared to some of their other LPs this season, but still strong. “It was very good,” said one of their coaches as they came off the ice. 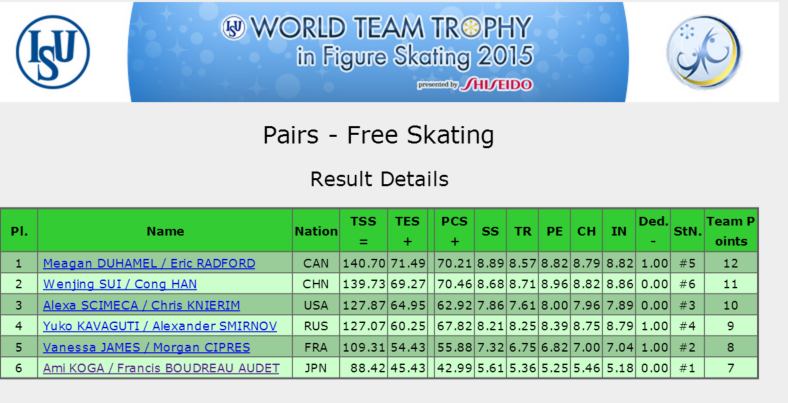 They scored 144.55 in the LP, a little off their season’s best at the GPF, but still more than enough for the win. After the event, D/R revealed they’re working on a secret new element for next year. Some of you may recall that I speculated on this possibility a few weeks ago in my column about Stolbova/Klimov. Obviously if D/R are successful, it will make it that much harder for Stolbova/Klimov (or anyone else) to catch them next year. Sui/Han had a breakthrough in Shanghai to unexpectedly take silver. After their very solid but not stellar season, I think many people, myself included, thought Pang/Tong or Peng/Zhang would be the top-ranked Chinese team. However, Sui/Han turned in two convincing, clean performances here to earn a career-best result. Sui/Han put out an excellent short program. Their SBS 3Ts were right on. Their throw 3F was so big, it almost got a bit wild, but Wenjing held onto the landing. Next came their showstopping ‘Tano triple twist, which earned many +3s. The home crowd was really behind them at this point, clapping along, and Sui/Han just took that energy and ran with it. Their Stray Cat Strut SP is a lot of fun, and this was easily their best performance of it this season. They earned 71.63, 4+ points over their previous season’s best, and were 3rd. Sui/Han drew to skate last in the LP. They had to take the ice right after a wonderful, emotional program from Pang/Tong, and I wondered how they would handle the pressure. But Sui/Han responded with a great performance. For the first time this season, they went completely clean in the LP. They opened with a terrific quad twist, followed by a 3T/2T/2T combo. Their throw 3F was again almost too big, but landed, and the throw 3S was even better, receiving almost straight +3s. 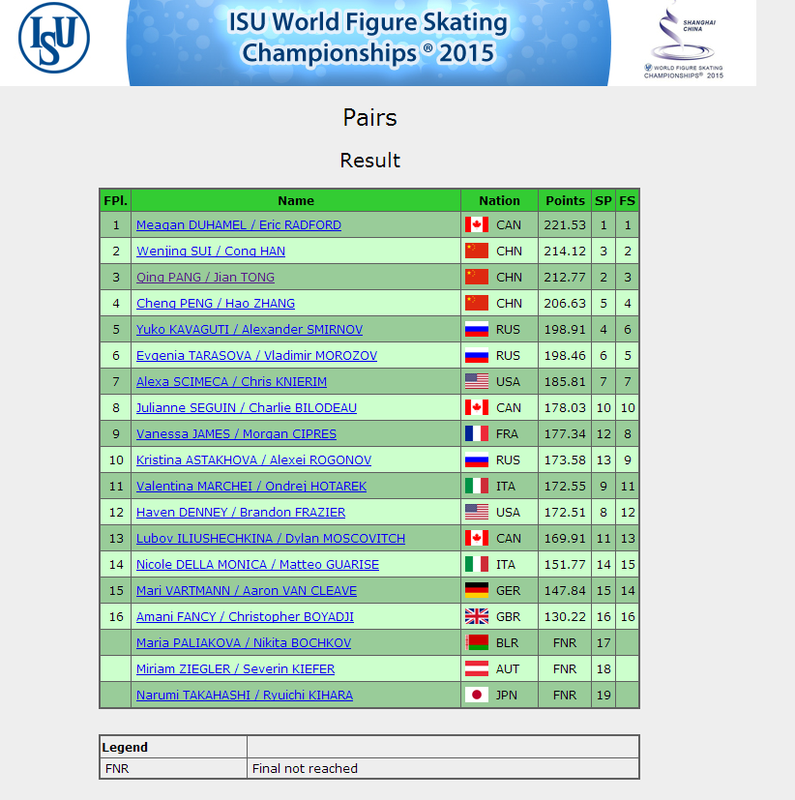 Sui/Han’s lifts in this program are very complex, but they performed them well and had great ice coverage. They skated their Francesca da Rimini program with much intensity and energy, and the home crowd supported them. It was a triumphant performance that left Wenjing in tears. They earned a personal-best 142.49 and had all positive GOE. Although their base value was more than 3 points below Duhamel/Radford’s, Sui/Han made up all the difference in GOE and actually beat D/R on the technical mark. It was an amazing moment for them, and I’m sure they’ll remember it forever. Pang/Tong created some incredible moments of their own at Worlds. Not satisfied with the tango SP they used at 4CCs, Pang/Tong worked with Nikolai Morozov to create a new short program to “Moon Flower” by Secret Garden. Pang/Tong skated this lyrical program brilliantly in Shanghai. All the elements were cleanly executed and woven into the program seamlessly. The throw 3Lp was smooth, the death spiral was lovely, and their SBS 3Ts nicely landed. It was a gorgeous program, and they placed second. Pang/Tong then followed with another great performance in the long program. They hit their opening SBS 2A. Pang singled the second 2A, but from that point on, they made no other mistakes. They landed the SBS 3T that they had missed at 4CCs; their lifts were good; and their throw jumps were excellent. They earned a perfect score for their throw triple Salchow: +3 from every judge. There were some slight imperfections here and there, but nothing that detracted from the overall beauty of their Io Ci Saro program. With other pairs, you wait for the next big trick. With Pang/Tong, what I enjoy most is the transitions between the elements. There are so many beautiful moments in their programs; so many lovely positions. And such chemistry. This pair truly skates together, as one. Younger pairs should watch and learn. It was another moving performance and received a standing ovation from the home crowd. They scored 140.18 and won their 6th World medal. Afterward, Jian Tong said this would be their final competition. If that holds true, Pang/Tong certainly went out on a high note. Peng/Zhang just missed the podium in Shanghai, but still skated extremely well and had their best overall score of the season. Peng/Zhang began with a clean, lovely performance of their Arabian Dance SP. They landed the SBS 3Ts–nice to see, as Cheng Peng has struggled with this jump. All their other elements were very well executed, and the program was beautiful. They earned 69.67, just a bit below their season’s best, and placed 5th. Their Allegretto long program was even better. All season, I’ve been waiting and hoping for a clean performance of this fascinating program. They got very close in Shanghai! Cheng had a small stumble coming out of the SBS 2A, but stayed on her feet. And every other element was executed to such a high level. Their throw jumps were amazing, with incredible distance and flow on the landings. They came very close to a perfect score for the throw 3S. And they again completed a level 3 quad twist that was the highest-scoring element in the whole competition. P/Z skated their intriguing long program to the best level yet this season, and I loved it. They earned 136.96, 5+ points over their previous best score, but I still felt they were underscored in PCS. I can’t wait to see what this team does next season! 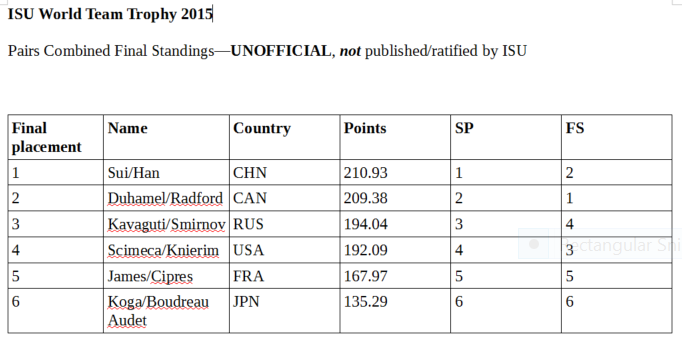 Well, there’s no way around it: It was a disappointing Worlds for Kavaguti/Smirnov. Coming in, they were looking to medal or win. Instead they placed a distant 5th. It all started well in the short program, where they hit their elements nicely. They landed the oft-troublesome SBS 3Ts and even got a level 4 on their triple twist. I thought their interpretation of Meditation from Thais was lovely and emotional. They earned a season’s-best 71.59 and were only .04 out of third place. A medal was well within reach. However, their long program did not go well. They looked a little tight and nervous throughout, like they were trying to force everything, instead of just let it flow. Sasha doubled the second jump in the SBS 3T/3T sequence. Yuko put a hand down on the throw 4S and turned out a little. Then Yuko fell on the throw 3Lp. They made it through the program, but the performance level suffered with the mistakes, and it just felt sloppy. Yuko was quite angry/distraught afterward, although she calmed down a little after Sasha comforted her in the kiss-n-cry. Obviously, it was well below their best and very disappointing to miss the medal stand. They scored 127.32 to place 5th. Kavaguti/Smirnov will skate at World Team Trophy in mid-April. They have yet to make a decision on whether they will continue next season. In contrast to Kavaguti/Smirnov, Russian teammates Tarasova/Morozov had an excellent showing at Worlds. This team has looked so promising all season, from the first time I saw them at Nebelhorn, and it was so exciting to see them skate well. Their Sarabande Suite SP was terrific. I was worried they would be nervous in their first Worlds, but not so. They opened with their gorgeous, soaring level 4 triple twist, and their throw 3Lp was also amazing. They skated with great speed and amplitude throughout, showing off their line and unison. My favorite part of their SP is the closing step sequence, which they perform with great power and strength. They earned 67.71 and were 6th. Evgenia/Vladimir put out an equally strong performance in the LP. They landed every element cleanly and skated with great freedom. If they were nervous, it hardly showed. Their triple twist was great; they landed both SBS jumping passes very well. The throws were excellent, with great distance. Vladimir had some slightly scratchy turns on their axel lasso lift, but he held on, and that was virtually the only flaw in the program. Altogether, they did the absolute best they could have in their first Worlds, and I’m so proud of them. (Also, I’m glad that we’ve seen the last of the Lionel Richie muzak program.) The judges were impressed and awarded them a season’s-best 130.75 points. They placed 5th in the LP, 6th overall, and were only .45 behind Kavaguti/Smirnov in total score. I feel there is no limit to this team’s potential. Their coach Nina Mozer announced that they hope to add the quad twist next year. Alexa/Chris came into Worlds with the goal of 6th place or higher. They fell one place short, so I’m sure they’re not completely happy. But I think they held their own in Shanghai and proved again they’re within striking range of that top group. Alexa/Chris were seeded to skate in the final group in the short program. They delivered a fine performance of their Tango de Roxanne SP. Their triple twist was great and received all +2s/+3s. Next, they successfully landed their nemesis element, the SBS 3S. They were slightly off sync, but the element was completed. The SBS spins were okay but also slightly out of sync. They ended the program strongly with a very good, high throw 3F and a lovely level 4 death spiral. Skating in the final group did show some of Alexa/Chris’s weaknesses compared to the top teams. You can see that their positions still need more refinement, their unison needs to be even better, and they can work on getting into the ice deeper for more powerful stroking. Still though, it was a very good program and scored a season’s-best 65.56 to place 7th. The long program was tough. Alexa/Chris started with a great quad twist. The GOE marks went as high as +3 (although inexplicably, they also received a -1). They scored 9.67 points, and I think by next year, they’ll be scoring above 10.0 on this element. Next they landed SBS 3S, although with a hand down from Alexa. Chris singled the first 2A and stepped out of the second. The landing on the throw 3Lp was stiff, and Alexa again put a hand down. The throw 3F was clean but hesitant. It was not S/K’s best long program, but they held on, stayed with it, and kept the performance level up. The lifts were all great and earned positive GOE. And I love how Alexa really sells this program as much as she can. I think she deserves some bonus points for that smile! Alexa/Chris scored 120.25 to place 7th in the LP and overall. Not quite what they were hoping for, but still, a nice improvement over their 9th in 2013. It’s also worth noting that Alexa/Chris hit a high total base value in this event—86.32, behind only D/R, S/H, and P/Z. They really have the technical content to be competitive. Now, it’s a matter of getting their presentation and quality up a level higher. Scimeca/Knierim said they hope to be selected for World Team Trophy. I had no idea what to expect from Seguin/Bilodeau, considering this was their first-ever senior international competition. I think Julianne/Charlie surprised most people, including me, by skating very well to place 8th overall. I was really impressed with the composure and steadiness of this young team. Julianne/Charlie started with a good outing of their Grand Budapest Hotel SP. Charlie’s landing on the SBS 3S was slightly off, and Julianne had a slight hesitation on the throw 3Lp. But their other elements were good, and the performance was charming. They received hardly any negative GOE and scored 60.53 to place 10th. Their Peter Gabriel LP was quite good. I didn’t really like this program the first time I saw it, but it’s grown on me. And it’s a great vehicle for Julianne/Charlie at this point in their career. It allows them to show off their speed and elements without requiring too much sophistication or refinement. S/B’s jump elements were strong. The SBS jump passes were both solid (although without much runout on the SBS 2A/2T). The throw jumps were good, too. Julianne/Charlie just go for it on the jumps—they don’t seem nervous or hesitant at all on their entrances. On throws, they don’t get the height or distance of the top teams, but they’re consistent. What I like most about Julianne/Charlie is how much they seem to enjoy skating together. They smile and look into each other’s eyes a lot; they just seem happy out there. They scored an impressive 117.50 to place 10th in the LP and 8th overall. The future looks bright for this pair. What an interesting event for James/Cipres! They really saved their best for last. After a disappointing season this fall/winter, they finally pulled it together at Worlds in the LP. Their Tango de Roxanne SP started off with a level 3 triple twist. Vanessa then doubled the SBS 3T, which cost them at least 3 points. The rest of the program was okay. Although I like this music for them, they needed a little more energy in the footwork sequence. Their score was 58.28 for 12th place. It was looking like yet another subpar competition for them. But then Vanessa/Morgan came out in the LP and laid down their best performance of the entire season. They landed a very strong SBS 3T/2T/2T combo, followed by SBS 3S. Their throw landings were both slightly tentative, but held. The triple twist was one of their better twists this season. Even some of the lifts were good, especially their final lift. This group 3 lift is very challenging—it goes from a rotational to a carry and then Morgan has to sink down to a lunge. This lift has been a problem all season, often receiving negative GOE. But Morgan totally nailed it in Shanghai, and the crowd roared as he came down into their final pose. Vanessa/Morgan are charismatic performers, and although I don’t think this program is the best vehicle for them, this was one of their best performances of it. It was nice to see them finally skate relatively clean. They scored 119.06, pulled up to 8th in the LP and 9th overall, and actually moved up a spot from 10th at Worlds last year. Good for them. I think their experience really came into play here and helped them. 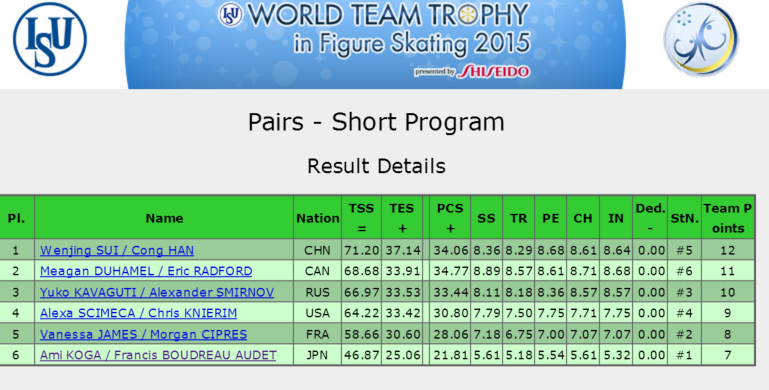 France has qualified for World Team Trophy, so I assume we’ll see James/Cipres at that event. This was the first Worlds for Astakhova/Rogonov. They did a good job overall to place 10th. Kristina/Alexei drew to skate second in the short program. 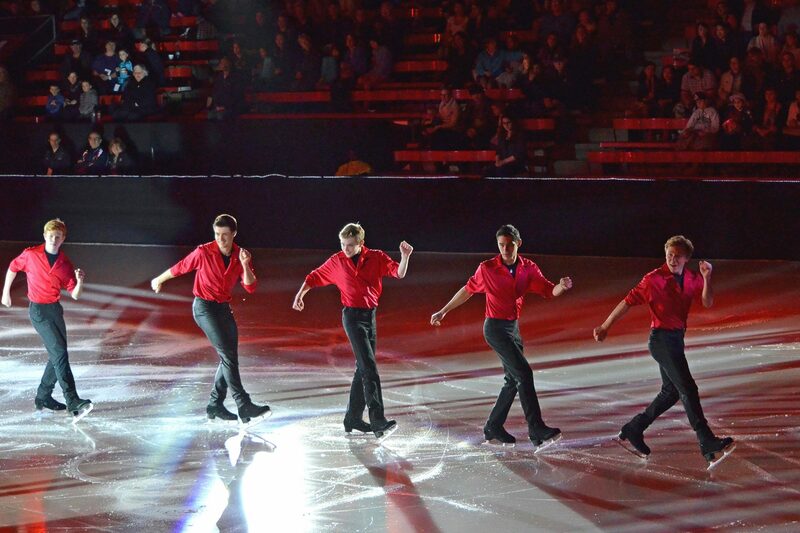 They put out a decent performance of their Nine SP–except for Kristina’s fall on the throw 3F. They also got some negative GOE on the SBS spin. They placed 13th. Astakhova/Rogonov then came back with a solid performance of their Master and Margarita LP. Their SBS jumps were both pretty good. The level 2 triple twist was low, with Kristina landing on Alexei’s chest. Kristina also landed low on the throw 3F but held on; the throw 3Lp was good. Overall it was a fine performance. They kept up the speed and energy level nicely (not easy with this demanding music), and there were no falls or major mistakes. They earned 118.03 to pull up to 9th in the LP/10th overall. It was a successful first season for Astakhova/Rogonov. There was a lot of buzz around this new team after their 4th place at Europeans. Valentina/Ondrej started with another strong performance of their Malaguena SP. Valentina is such a sharp and expressive skater, and she really shines in this Latin program. Overall I felt their performance was more subdued than at Europeans, however, it was still very good. Their SBS 3S were well landed, although slightly out of sync, and the throw 3F had good rotational speed. They again performed only a double twist. The closing footwork sequence is the highlight of this program and was fast, sharp, and very well skated, receiving a level 4 and positive GOE, including one +3. They earned 60.56 points and placed 9th. Valentina/Ondrej’s La Strada LP got off to a good start. They opened with their impressive SBS 3Lz, followed by throw 3F. They lost sync in both the SBS spins and the SBS 3T/2T/2T and received negative GOE. Still, they were skating well until the final axel lasso lift. Ondrej lost control on the entrance, Valentina did not get above his head, and they got 0.00 for the lift. This cost them at least 6 points, and they fell to 11th in the LP and overall. I’m sure they’re disappointed with their placement. But the mistake on the lift is exactly the kind of fluke that happens to new teams, and no doubt they’ll be much more consistent next year. They again scored well in both GOE/PCS, making a positive impression on the judges in just their first year. I think Marchei/Hotarek should be pretty happy with their first season! Haven/Brandon didn’t have their best performances in Shanghai. However, they did improve on their score from 4CCs, and it was a decent competition for them. Their Godfather short program was good. The opening triple twist was well done, as was the throw 3Lp, but then Haven put a hand down on the SBS 3S. Their SBS spins were only level 2 but well synchronized. Their death spiral got level 4 with positive GOE, which was nice, as this is sometimes a weak element for D/F. I thought they skated the program very well. It could have had even a bit more energy and attack, but it was a good skate, and they placed 8th. Unfortunately, Haven/Brandon had some problems in their Lion King LP. Brandon doubled the 3S; Haven fell on the first 2A; and they skipped the second 2A. Those errors cost them about 8 points. Haven also landed forward on the throw 3Lp, which decreased their GOE. I felt that Haven/Brandon again skated a bit flat and tight in this long program. It wasn’t a disaster, but it wasn’t their best. They scored 111.19 and dropped to 12th in the LP/11th overall. I so much want to see Haven/Brandon just let loose and go for it. Despite the mistakes in Shanghai, they have some great elements. Their lifts, twist, and throw 3S are reliable, strong, and get high scores almost every time. Their spins and death spiral could improve, but they have a solid base, and I hope they can gain confidence this summer with new coach Ingo Steuer. In their pre-Worlds press conference, Haven/Brandon said they’ve worked on the throw quad Salchow and may continue that. Personally, I feel they might be better served concentrating on basics right now—stroking, posture, spins, and, most of all, performance level. Taking more dance, ballet, and acting classes might not be a bad idea. 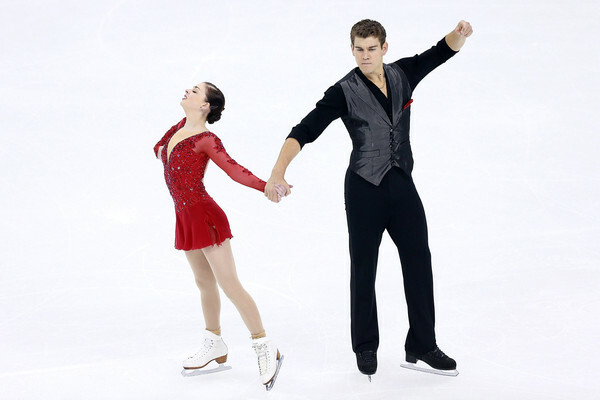 Duhamel/Radford have done all those things–and look where they are now. Denney/Frazier have the goods technically. What they need to keep working on is confidence and the total package. What a thrill it was to see Luba/Dylan at their first Worlds! I’m a huge fan of this pair and really enjoyed their performances. I’m sure their final placement of 13th is not where they want to be. But their problems were the same kind of fluky, first-year issues that plagued Marchei/Hotarek. Luba/Dylan had a good SP. Dylan landed forward on the SBS 3S and put a hand down. However, their other elements were pretty strong. They completed the triple twist and earned mostly positive GOE. Luba was slightly forward on the throw 3Lz but held on. The lift was great and got some +2s from the judges. The program was so enjoyable to watch, as always. They earned 60.32 to place 11th. The first 3 minutes of Luba/Dylan’s From Russia with Love LP were great. They hit their SBS 3T/2T sequence and got almost all +2s. The triple twist was okay; the SBS 3S were well landed. There was a little problem on the throw Lutz takeoff but Luba saved the landing, and the throw 3Lp was really good. But then, things went awry. Luba stumbled on the step after the throw 3Lp, and this seemed to throw off their timing on the difficult cantilever entrance to the death spiral. They got no points on the death spiral. There was also a problem on the final lift, and Luba came down early. Altogether, they lost at least 7 points’ base value in the final minute. OUCH! “Well, that was weird,” said Dylan in the kiss-n-cry. They scored 109.59 and fell to 13th in the LP/overall. The first 3 minutes of that LP showed what Luba/Dylan are capable of. In the last minute, I think their timing just got off, and they didn’t have the experience/comfort level to recover quickly. It was similar to what happened with Marchei/Hotarek and with Ilinykh/Zhiganshin in the free dance. Luba/Dylan’s LP is choreographically complex, with ambitious, difficult transitions. It’s a high-risk/high-reward program for a new pair, and at Worlds it caught up with them a little. I’m very proud of Luba for landing all her jumps at Worlds, after having her jumping skills questioned in the past. I also love her fearlessness as a performer. Just a little example of what I mean . . . When you watch pairs in sit spins, you often see the partners staring past each other with glazed expressions. But in Luba/Dylan’s sit spin, Luba looks straight into Dylan’s eyes and strokes his hair, establishing a connection between them. It’s just a little example of how Luba doesn’t hold back in her performance. She really goes for it and puts it all out there, and I love this about her. I already can’t wait to see more of this team next year! Alas, Nicole/Matteo did not have a great competition. Their Cinderella SP wasn’t too bad. Nicole spun out of both jump landings, but the other elements were fine, and it was a nice, smooth performance. They earned 54.48 to place 14th. However, their Mask of Zorro LP was a mess. Nicole fell on 2 jumps and two-footed the throw 3S. Also both of them stepped out of the SBS 3S. The other elements weren’t bad, but all the mistakes definitely detracted. They scored 97.29, ten points off their LP score at Euros, and were 14th overall. I would not be surprised to see a coaching change for this pair in the offseason. This was the last competition for Mari/Aaron. Reportedly, she has already started training with Ruben Blommaert and only practiced with Aaron for a week or two prior to this event. Nonetheless, they had one of their better competitions together. They made it through the long program without any falls—that in itself was a victory for this team! They finished 14th in the LP/15th overall. It was a bit of a surprise to see this British team in the final 16. Their best element was probably their SBS 2A/2A sequence in the LP. They also landed the throw 3S in both programs. However, their skating lacks speed, polish, and sophistication. They finished 16th but were 17+ points behind Vartmann/VanCleave. I was surprised to see Ziegler/Kiefer miss the long program. They finished well above Fancy/Boyadji at Europeans, so I’m not sure what happened here. Miriam fell on the SBS 3S in the SP, but their PCS score was also below Fancy/Boyadji’s, which I didn’t quite understand. Paliakova/Bochkov had a number of minor errors in the SP and again got low PCS. Takahashi/Kihara placed last in the SP with mistakes on both jumps and the double twist. They announced their split right after Worlds. Both will look for new partners.